There has been no doubt that 3D printing has brought many influences to the medical industry; but as we saw how engineers used 3D printing to save Buttercup's life, it is evident 3D printing is being used to help animals in the same way it helps humans. Australia's Southpaws Specialty Surgery for Animals is taking the first step forward and using 3D printing technology for faster and more accurate diagnosis as well as improved precision and efficiency in surgery. Dr. Charles Kuntz says he is always on the look-out for the newest cutting edge technologies to improve his practice. 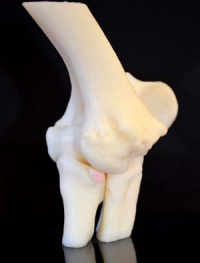 He recently discovered the benefits of 3D printing and acquired a 3D printer which enabled the surgeon to model a critical joint or physiological feature. "Take for example, a dog that has a bone chip in the elbow joint," explains Dr Kuntz. "The initial CT scan or X-ray will likely show the problem, but it is difficult to explain to the family how it has occurred and what treatment is required. With a model of the joint showing where the damage has occurred, not only can the referring vet make a better judgement on whether specialist surgery is required, but can also show the pet owner how it will be done." The 3D printer has proven to be a useful tool for this veterinarian as 3D printing was applicable to many processes such as the assessment of tumour removal techniques, seeking the most effective places for surgical incisions on bone and research into atypical conditions for dogs and cats. In addition to its aid in preparation and research, Dr Kuntz is also able to 3D print orthopedic implant devices to stabilize and repair affected bones and joints of animals. "The more we use the 3D Printer, the more uses we find for it," says Dr Kuntz. "We can now use the models to plan our surgical approach, or use it to make a model for bone replacement out of titanium. We have also used it to make a mold out of putty that we can sterilize and place on the bone as a cutting template."